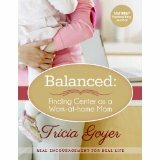 you’ll want to get a copy of Tricia Goyer’s Balanced: Finding Center as a Work-at-Home Mom. Why? Because Tricia addresses all these issues at their foundation, by pointing you to God. Beginning with her personal story, Tricia then moves on to why working at home is good for work and why working is good for the kids. Then she gets personal: how God works in us, how we work from our core, how we can follow our God-given dreams, and how we need freedom through knowing ourselves, confession, and repentance. As expected, she also shares practical tips on successful family living, managing your schedule, and not doing it all. But, she points out in the last chapter of Balanced, balance is not the goal; knowing God is. To give you a taste of what Balanced by Tricia Goyer is all about, I’m going to share my favorite quotations from my 19 pages of notes. 1. What I do isn’t as important as who I am. 2. What God can do in my life and what He’s capable of doing can be two very different things—I don’t want to limit Him. 3. My outward goals are only reachable if I submit my inward soul to God. “Just do what you can” is being creative in the moment with the time I’ve been given, and it’s amazing how much really gets done in the end! Obviously, Tricia Goyer is a woman who loves the Lord, who has learned to manage many different responsibilities (one husband, 6 kids, homeschooling, a teen mom ministry, 4-5 books a year—imagine all that! ), who has thought about priorities, and who wants to help others use their lives in God’s service. I’m so thankful to learn from her. 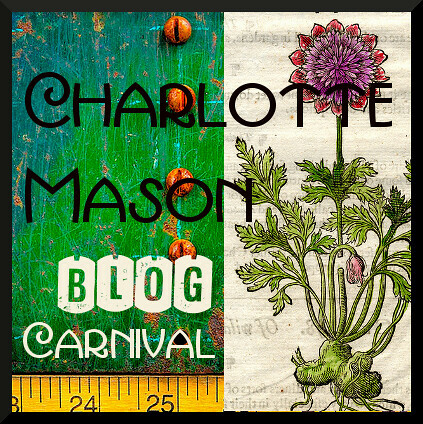 There’s so much here, the practical things like scheduling tips, priority examples, and so forth, but especially the God-centeredness in all she does. Of course, that does not mean I agree with everything she says–or even with all the quotes I listed above. But Tricia has given me a lot to think about as well as some practical tools to seek balance in a particularly busy season of my life. She has reminded me of my focus and priorities and of God’s goodness and providence, and I am grateful for all of that. Balanced: Finding Center as a Work-at-Home Mom is about having the Lord at the center of life, as well as about practical home and work issues. I highly recommend this inexpensive ebook to any Christian woman, whether she works for pay or not. 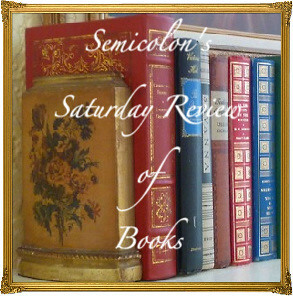 This is yet another book in the in the 2014 52 Books in 52 Weeks Challenge, and is also linked to Saturday Reviews. Disclosure: I received this ebook from LitFuse for the purpose of this review and have presented my honest opinion. Sounds like a good book. I’ll have to look into it soon.